A highly ranked private school in Boston MA had changed their former auditorium into a conference room, but soon found out that the echoing within the room was unbearable. After a quick call to New England Soundproofing, we were able to assess the situation and recommend a perfect solution. The room had 25’ high ceilings, with wood floor, gypsum/plaster wall areas with lower walls covered with decorative wood panels, and a gypsum ceiling with a large skylight in the center. During the site visit, it was observed that the reverberation in the space was much too high for a conference room. Speech is able to reverberate (echo) off the hard walls, causing poor speech intelligibility. It was difficult to understand speech during conferences and presentations. New England Soundproofing came to a solution of adding their 2’’ ceiling Acoustic Panel. 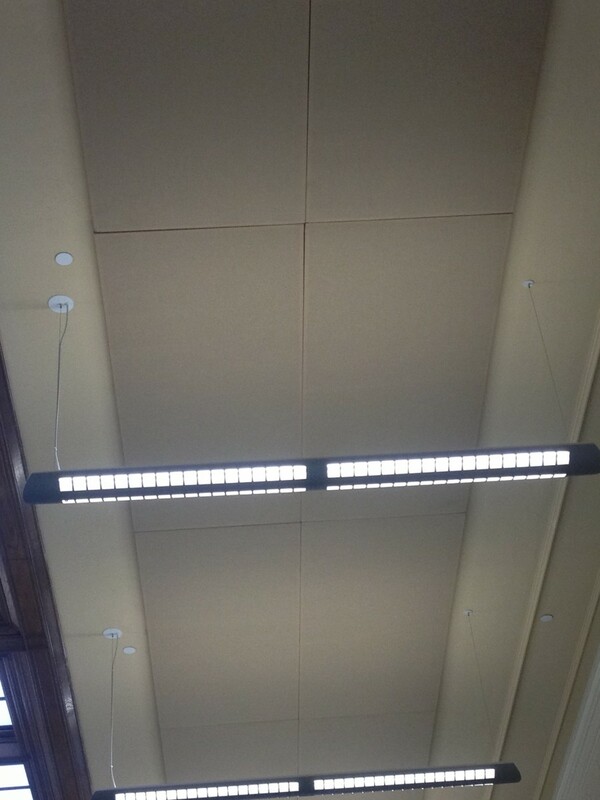 The panels were wrapped in a nice Guilford Of Maine cloth in which the color matched the ceiling color very nicely. There would be 650 SQFT of paneling on the ceiling, panel size ranging from 2’x4’ to 4’x8’. The panels were custom designed and affixed next to each other to make it look like one big panel. New England Soundproofing built and installed the panels to the exact specifications for this room. Each panel was custom made within New England Soundproofing. After the installation by New England Soundproofing, there was a major difference in reverberation within the room. The school was very satisfied with the project, and now can use the room with peace of mind. Below Are Video And Pictures Of The Project.